As it begins to look more and more likely that the NFL draft will not return to Philadelphia next year, one local radio show is campaigning to keep the event in the city. Anthony Gargano, morning host at 97.5 the Fanatic, started the online petition, which as of Friday morning is about 500 signatures short of its 5,000 goal. Philly has a reputation for being a tough town. Philadelphia sports fans represent that toughness. We all know the stories; snowballs, Santa, batteries. But during the 2017 NFL Draft in April, 250,000 people represented Philadelphia for who we really are... passionate about our city and football. Even though the Mayor of Philadelphia has said that they will gladly host the Draft again in 2018, there is talk that we may lose the Draft to Dallas. DALLAS!?! We can't let this happen, we need to show the NFL that we want the Draft back in 2018... if for nothing else, it's another reason for a great party. Dallas is reportedly the front-runner to have next year's event, but the national media's love affair with Philly's hosting abilities caused some to speculate we could easily do it again. 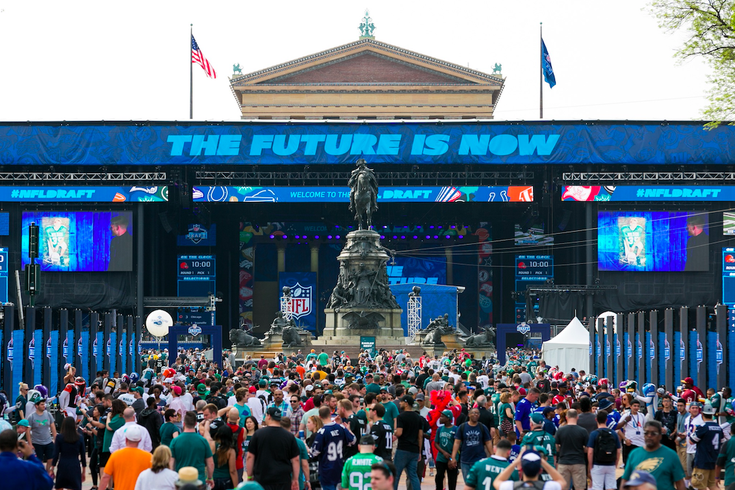 The NFL said Philly set the record for attendance for the draft, bringing more than 250,000 to the Benjamin Franklin Parkway. But ESPN's Adam Schefter said in a recent interview with the Fanatic that with so many other cities vying to have the 2018 event, it's hard to see Philly getting it again, no matter how well the city did.